A recent global review concluded that parenting interventions must do a better job of including and engaging fathers. 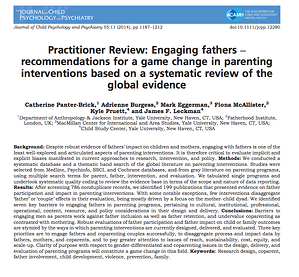 It also concluded that evaluations of interventions' impact should include separate analyses of fathers and mothers rather than parents in general. Really? I don't mean to be crass, but these conclusions are not exactly revelations. The review does, however, lend additional credibility to what National Fatherhood Initiative (NFI) has said for 20 years--that it is vital to engage fathers in parenting interventions separately from mothers (we call them "fatherhood" or "fathering" programs) and that more funding needs to be focused on the impact of father-specific or father-inclusive parenting interventions. Despite the evidence of fathers substantial impact on child development, well-being, and family functioning, parenting interventions rarely target men, or make a dedicated effort to include them. Parenting interventions that have included men as parents or co-parents give insufficient attention to reporting on father participation and impact. A fundamental change in the design and delivery of parenting interventions is required to overcome pervasive gender biases and to generate robust evidence on outcomes, differentiated by gender and by couple effects in evaluation. It is the final problem that is most damning. It has has led to parenting interventions, focused on mothers, that will never reach their full potential to improve child well-being. There is a gender bias in parenting interventions that reflects a broader, global, damaging bias that says fathers aren't as important as mothers when it comes to child well-being. It is the most pervasive barrier we've encountered in our 20 years of existence. How does NFI address this barrier? The first part of that answer is evident to most people. We've created evidence-based and evidence-informed programs, workshops, and other resources designed specifically for and that engage fathers. The second part of that answer is not as evident. We've created workshops and other resources that build the capacity or organizations to engage fathers, such as our recently-released Father-Readiness Training Kit™, that transform the culture of those organizations to value fathers as much as mothers in improving parenting behavior and, consequently, child-well being. We've said for many years--preached, really--that because the culture, infrastructure, and staff training of most organizations are designed to serve the needs of women and mothers that they are ill-suited for effectively engaging fathers. They create a mindset that focuses programs, services, and staff on mothers. As a result, organizations must examine and, as is the case in almost every instance, change their norms, the attitudes and beliefs of staff, and improve infrastructure to effectively serve all parents. Parenting interventions will never truly be parenting interventions until they are implemented within organizational cultures that value fathers as partners in parenting who are critical to child well-being. The sad fact is it isn't that difficult to do. It simply takes what my grandparents called "gumption." Gumption involves courage, initiative, aggressiveness, and good old common sense. What is your organization doing to build a foundation for effectively engaging fathers? How much do you know about the range of father-specific resources and customized solutions NFI provides?